The Ostroy Report: South Carolinians: WTF!!?? A funny thing happened on the way to the polls in South Carolina Tuesday. Voters in what Gallup cites as the sixth most religious state in the country re-elected Republican Mark Sanford, an Episcopalian, to the congressional seat he held from 1995-2001. If you don't follow politics too closely this wouldn't seem unusual. But this was no ordinary election, and no ordinary victory, because Sanford is the disgraced, nearly impeached, former governor of this apparently amnesic and/or hypocritical state. 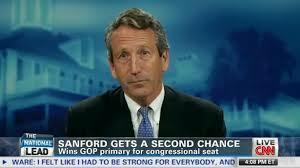 For a week during June 2009 Sanford disappeared...about as AWOL as National Guardsman George W. Bush in '72 Alabama. Ostensibly hiking the Appalachian Trail, which is what he told his family, staff and security detail, he was incommunicado for days, even failing to call home on Father's Day. But when he was discovered by a reporter at the airport in Atlanta returning to the U.S. from an overseas flight, the story became a national sensation. Hours later he confessed that he'd in fact flown to Argentina to be with his mistress, María Belén Chapur, in what he characterized as a passionate, loving relationship with his "soul mate"...unlike the many other "line crossings" he had engaged in with other women during his 20-year marriage. The affair was a humiliating blow to his wife Jenny and four young children, and a crushing disappointment to voters. But it apparently wasn't that upsetting to Sanford's very forgiving constituents, who handed him a 10-point victory against Democrat Elizabeth Colbert Busch, sister of television's political satirist Stephen Colbert, in the state's special election. And there's something very troubling about how quickly his abhorrent, deceitful, selfish behavior has been absolved by the very same people who vehemently attack the morals and ethics of President Obama, a deeply religious, faithful family man who, unlike Sanford, lives his life according to the principles they piously embrace, and who doesn't just talk the talk as do hypocrites like Sanford. What's wrong with this picture?